People mess up and hurt each other with words and actions. Oh wait – we are all those people at some point in our lives for we are an imperfect people living in a broken world. 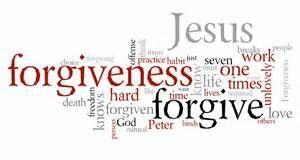 To forgive, according to the dictionary means to stop feeling angry or resentful toward someone for an offense, flaw or mistake. Wow! Stop feeling angry or resentful. Saying it is much easier than doing it I find, especially sometimes. The Bible tells me to forgive others as Christ has forgiven me. 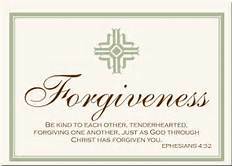 It also says to forgive so I can be forgiven. Forgiveness is a command. It is a condition of us knowing forgiveness. I believe that forgiveness has nothing to do with whether the other person deserves it. We do not deserve for God to forgive us. It is a gift, an act of mercy and grace. It is given out of love. 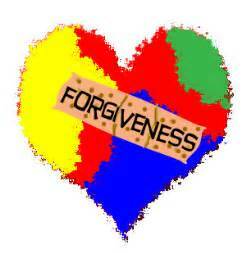 Forgiveness mends out broken hearts. It allows us to move on and keeps bitterness from growing like a bad week in our lives. It pulls the dark shadowed piece of puzzle out and gives a better fitting piece in its place. Almost four years ago my husband’s health started to decline. He began to have problems with his water works and sought medical treatment. Several tests revealed things that caused a red flag and needed to be followed up but the specialist put off doing anything but ordering another test with a long wait time – a test my husband did not need. Over the next couple of months he became sicker and sicker. His doctor tried to get the specialist to see him but nothing happened. A visit to the ER resulted in pain killers, not a thorough investigation into the cause of the problems. I feared my husband would die shortly. I became angry at the medical system and their seeming lack of compassion. This anger and fear clouded my judgement, colour my world with negativity and worry. Finally an ER doctor took the symptoms seriously and did something to relieve a bit of the problem. He also told the specialist he needed to do something and not the test and he needed to do it now or his patient would be dead. That day the specialist saw my husband and began to do something. But my anger continued. It spilled over into other areas of my life. I had no peace. I had no patience. The dark pit of depression threatened to engulf me. I needed help. I needed to forgive so I could be free. It did not matter if the doctors took responsibility. The onus rested on me to let the anger and resentment go, to give it to God and let him restore me, bandage my heart and put the pieces back together. It took me longer than I like to admit but I finally let go. It is a work in progress way too often in my life. Doctors are imperfect people just like I am. They can procrastinate. They can be wrong. They can mess up. Holding on to my anger did nothing to them but it made me hurt, lose focus on what God wanted me to do and make bitterness grow. I still have my husband, although the result of the procedure showed his cancer had returned. Only a miracle can cure him as all the other options are not viable. But God’s timing is the best even when I do not understand it. The puzzle pieces of my life appear very scattered and messed up. I do not always see how they will fit together but at least the anger is not taking over my life thanks to forgiveness from God and his showing me how to forgive others. God commands us to forgive one another. Forgiveness is hard, especially sometimes. God waits to help us and to forgive us. Posted: October 24th, 2017 under puzzle pieces of life, Storytelling.